My name is Jess and I am 23 years old. Over the past five years, my mum has been incredible and never given up on me. I was formally diagnosed with anorexia four years ago, but I had problems since I was sixteen. Back then, I still believed in the misconceptions of anorexia. I learnt the hard way eating disorders aren’t just about food. The illness tainted nearly every aspect of life; I was too physically and mentally exhausted to focus on anything. My whole world narrowed to the illness and I just shut myself away. It took me a long time to realise I’m the only person who can actively take responsibility for my recovery. But, it’s a long and unpredictable process. Despite the frustration anorexia can cause, my mum’s patience has given me the motivation to keep persevering, even when I don’t feel able. 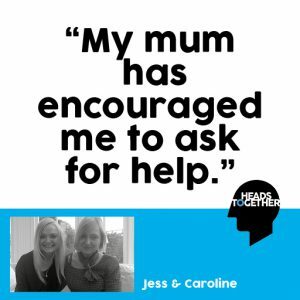 My mum spent a lot of time learning about eating disorders and she’s worked out the best ways to help me, as well as help me think about the best ways I can help myself. My mum encouraged me to ask for help; to do things like yoga and reading to manage stress. When I was away at university she would often just wait on the phone while I tried to eat, cook or do food shopping. It may be a cliché, but recovery is a journey that takes different turns as I enter new stages of my life. I’m looking forward to my future as a doctor, and I know with the amazing support of my mum, I can lead a life that is both content and fulfilling. Jess is a Young Champion for Anna Freud National Centre for Children and Families, see their website for more information on services. Are you or someone you know struggling with an eating disorder? Beat is the UK’s leading charity supporting anyone affected by eating disorders, anorexia, bulimia, EDNOS or any other difficulties with food, weight and shape. Visit their website here. Our charity partners also run a range of support services such as helplines, that can be a good first step for finding support in your area. Find out more here.